I get emails constantly by companies offering free gear. Sometimes they just offer free gear and sometimes they are looking for paid placement on ShootTokyo through my posts. I have said no every time as I am not a gear review site and I am not looking to have brands try to dictate what I say here. ShootTokyo is not about money for me. It's about my passion for photography. If I like something I talk about it here if I don't I usually just don't say anything at all. I don't see the point in tearing something down just because I don't like it. I never want to be the kind of person who takes away from others. I got an email from DJI about a month ago asking me if I was interested in trying OSMO. They aren't offering free gear or money just the chance to give their latest camera a try. To be honest I have never heard of OSMO before but after looking at it I really wanted to try it. After speaking to them I liked their philosophy - they will loan me the camera for a month and the only string attached is that make something with it. Basically try it and see what it can do. That seems pretty fair and aligned with my thinking on ShootTokyo. It says a lot that the company wants to let the product speak for itself. OSMO is a really neat device. They have taken a 4K camera from a drone and integrated into a hand held 3-axis stabilization handle. What this means is that the shake you typically get with hand held video is all but gone. You can take pretty amazing hand held video with this. OSMO uses your mobile phone via WiFi as a monitor for the camera. You also have the option to record directly on your mobile phone so a lot of possibilities for quick on the go videos. It also does in camera timelapses which makes for great B-roll. I'll do a more comprehensive right up once I have used the camera for a while. Initial reaction is it is amazing with a few quirks but they can be overcome. Here is what I was able to capture 20 minutes after getting it out of the box. Like with my photography I need something extremely portable that I can take with me so I can take video on the go. I can't be lugging around a tripod, a steady-cam rig to keep my videos shake free or an extra bag of gear. This leaves me creating much less video than I want. I need something that I can drop into my current small work backpack. This might just be the solution for me. I am going to try to make a video a week for the next month and see if I can work out a good workflow for me. I want to do the same daily type imagery I was doing here on ShootTokyo but in video. I am still dealing with family health issues that are keeping me close to home. This actually adds to the challenge of taking interesting video without really getting out to shoot. I will posting them over on my YouTube Channel. "This is so exciting Dave!, How can I help?" Glad you asked! 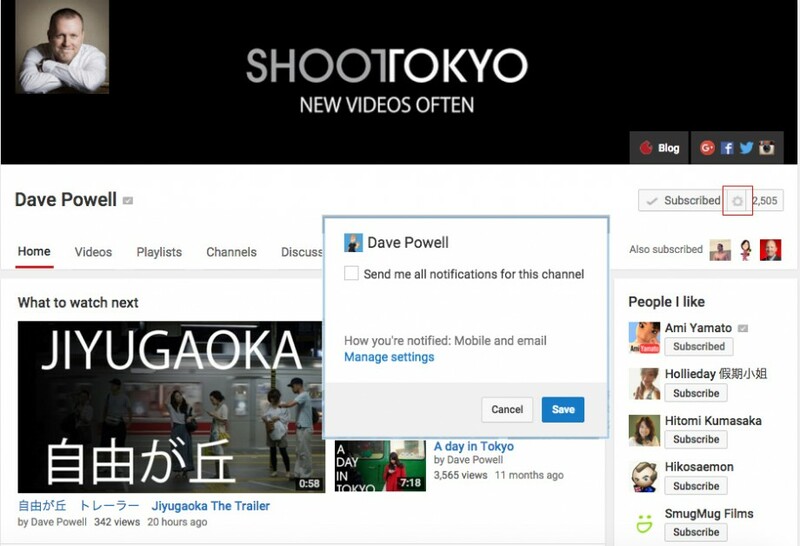 Please Subscribe to ShootTokyo's YouTube Channel to my YouTube channel. If you are already subscribed to my YouTube Channel head over to my YouTube Channel and click the gear icon next to where it says Subscribed. Check the box and click save. You will now be notified when I post new videos. I need feedback and encouragement as I progress along this project. On mobile click Subscribe and you will see a pop-up at the bottom of the screen to turn on notifications for new videos. If you are already subscribed click the bell next to where it says Subscribed and you will get notifications for new videos. "How else can I help?" Glad you asked again, please help share this post by clicking the links below or my YouTube Channel out on your social networks. Views, comments and subscribers are great motivation for me to keep creating more content. I am still figuring out what I want these videos to be so if you have any good ideas for videos please leave a comment here or on my YouTube Channel. Thanks for stopping by today. Be well.